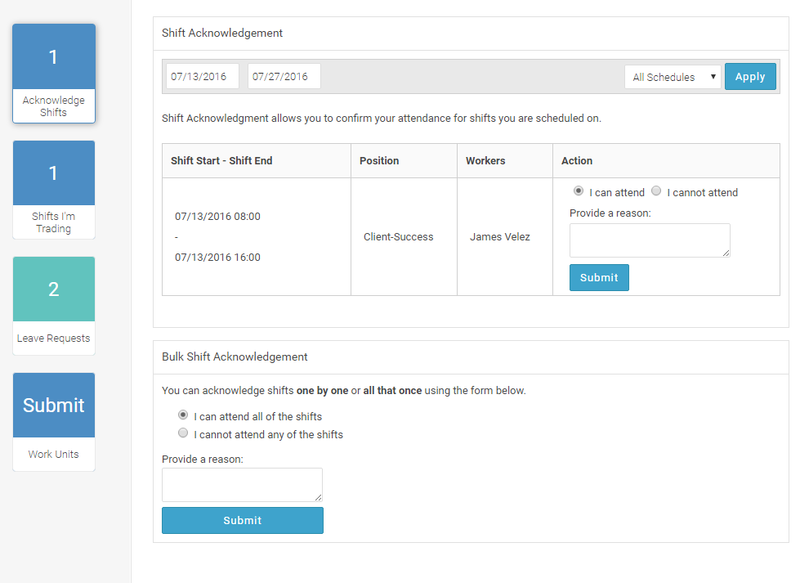 Shift Acknowledgement feature enables the Managers/Supervisors/Schedulers to get notified if an employee acknowledges or Un-acknowledges the shift. The managers/admins can enable this feature by navigating to the tab Settings > Schedule and there enable the option Enable Shift Acknowledgment. After you publish the shifts, employees are notified via email. Also, a dashboard widget Acknowledge Shifts will appear on their account's Dashboard. After an employee click on that widget, shift acknowledgment page will appear where they can submit their feedback with reason. 1. Acknowledging a shift means that the employee is ready to take that shift. 2. Un-acknowledging a shift means that the employee is unable to take that shift. Managers can set the email/text notification interval, under the tab Settings > Schedule, to get notifications if employees do not acknowledge the shifts. Or can also pull the Shift Acknowledgment report, from the Reports section.